If you're visiting Spain in July, make sure you make it to some of the country's excellent local festivals. Expect a lot of fellow travelers; July is high season for tourism in Spain and most of western Europe. Generally speaking, in July visitors can expect high temperatures on Spain's south and east coasts and even warmer temperatures in central Spain. Cooler summer weather will be prevalent in the northern parts of the country. Bullfighting is deeply rooted in global historic traditions. But today, local public opinion leans against the tradition. Though the site includes information for tourists interested in attending the events, TripSavvy trusts its readers to make their own decisions on the ethics of bullfighting as an attraction. 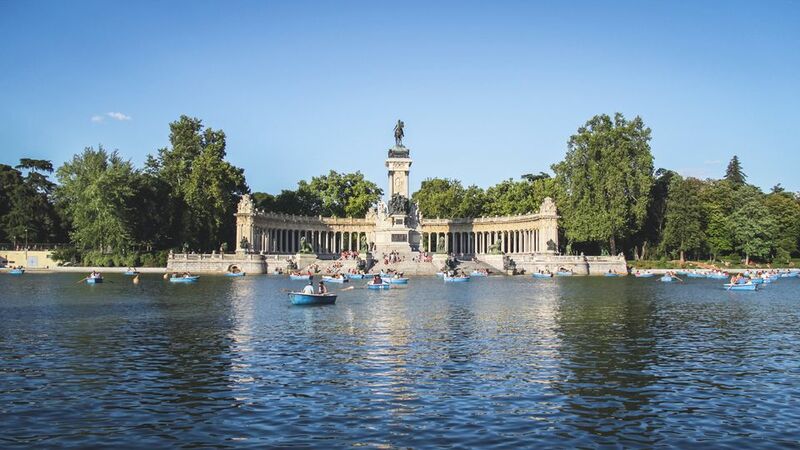 Why wouldn't Spain's capital city be a great place to visit in July? There is always lots to do in Madrid. The Veranos da la Villa, a music and performing arts festival, runs throughout the summer in Madrid. The Feast of Virgen del Carmen is a saint's day with a water fight in the Vallecas district of Madrid. Madrid also has the longest bullfighting season in Spain. Madrid's central location in Spain and its importance as the capital means all roads lead here. There are high-speed trains from Barcelona to Madrid as well as from most big cities in Andalusia, and trains and buses connecting the whole country to the capital. The main draw in Cordoba in July is the Festival de la Guitarra, featuring flamenco, blues, classical guitar and a host of other styles. Cordoba is also home to Mezquita, one of the largest mosques in Europe. It draws a lot of tourists. especially during the summer months, but is worth a visit if you're in town. Cordoba is on the high-speed AVE train line from Madrid to Seville, so can be accessed quickly from both of these cities. It is also well connected by bus from all over Andalusia. Bilbao is perfectly located for many events in July in Spain. First of all, if you have the stamina, you could in a 'night trip' to Pamplona for the Running of the Bulls. Take a bus from Bilbao to Pamplona in the evening, party all night and catch the bull run in the morning before taking the bus back. Coinciding with (part of) the Pamplona Running of the Bulls is the BBK Live music festival. And there's the Jazzaldia festival in nearby San Sebastian, an easy trip from Bilbao on public transportation. If you have a car, you could also visit Anguiano for the Danza de los Zancos stilt walkers, an ancient regional religious tradition. The Running of the Bulls, the focal point of the eight-day San Fermin festival in Pamplona, is one of Spain's most famous events. Every morning thousands of brave locals and festive foreigners run in front of six angry bulls into the bullring. In the evening, there are bullfights. Through the night, everyone drinks in the streets. Pamplona is a pleasant city outside of festival time, but it is really all about the running of the bulls at this time of year. When people aren't drinking and partying, everyone will be asleep. As you can imagine, accommodations are expensive in Pamplona this time of year. Many people opt to stay in nearby cities such as San Sebastian or Bilbao and commute to the bull-related events.